Hello everyone. First of all, I hope you all had a great weekend and are all set for an even better trading week ahead! Losses in trading are normal. I know I say this all the time. I'm like that old, gloomy teacher lamenting on life, focusing on the negative aspects and warning of everything that could possibly go wrong. Well, not exactly. I focus a lot on the losses in trading because they are a huge hindrance to traders. It's not the losses that have the devastating affect, but rather the reaction to the losses. I have losses! I know my results of late have shown so very few draw-downs, but they do happen. For example let's take today: The market was very negative on the daily time frame. It was negative in before hours trading also. I was looking for a sharp spike, like a finger prod, into the 6300 levels for a sell. I turned the computer on at 7:15am and wouldn't you know it, the spike happened at 7am. I missed it. Fast forward to the open. One of my trades set up. It's a trade I call the Spring Bounce Trade. Now ideally I wanted to sell from that spike at 7am. However my Spring Bounce Trade announced a sell just after 8am from lower down. In my mind it was already too low and I wanted to get in higher. But my trade setup was there, and from experience I know not to 'predict' the market. I entered the trade, following my rules. The market dropped to within 5 points of my target and then reversed, ending up with me being stopped out for a full position loss. I should also point out that the Spring Bounce Trade is the only trade I don't actively manage. Take profit and stop loss are set on entry and I don't adjust anything. Those are my rules and I stick to them. So anyway, I take a full loss. Yikes! What a way to start a Monday morning! And then to top it off... My next trade was a loser as well. Two losses in a row... Thank you Monday morning! Ok, you get the idea. Hopefully if you've been following me long enough, you spotted that last paragraph was a lot of nonsense. But it is exactly what happens to a large portion of traders. They let losses snowball until its something so huge rolling down the hill that nothing can stop it. 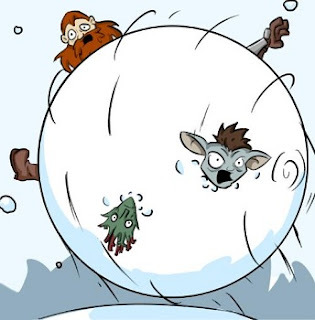 And that snowball is made of your capital. I did take two losses this morning. One was the Spring Bounce Trade, full position. The second was one I managed and cut back for a smaller loss. It was frustrating and I was annoyed. However I didn't let it influence my trading. Because I know losses are part of the business. And what are two losses over the week?The month? The year? The rest of your trading career? This is the wrong mindset and it is dangerous. You need to put losses behind you. It doesn't matter if you have a down day or week or even month. What matters is your overall performance and your discipline to follow your trading plan. So I was ready for a losing day. I was ready to spend all of tomorrow and perhaps some of Wednesday getting back to breakeven. It's life and it's part of the trading game. Anyway, the market ramped up higher. I had a position for a blind sell located right where the 9:10am candle closed. It's difficult to sell into a rally like that (I trade the FTSE 100 if you want to look at it on the chart). But I sold. The next candle produced a piercing pattern. I entered a second position as the market broke the low. A little voice in my head said ''If these trades lose you'll be even further down, you should buy and ride the trend.'' I ignored it, as all professionals do. The market duly dropped. And I'm now back in profit for the day. Below is a picture of today's chart, showing the sell positions that brought me back into profit. There's also profit displayed at the top of the screen. Hopefully the picture should enlarge if you click on it. Stick to your plan. Don't let losing trades control your emotional state. And I hope you all have a great trading week!